Bi Gan's LONG DAY"S JOURNEY INTO NIGHT is an ethereal mess. The film about a man searching for a woman who meant something to him in his youth and who is seemingly drifting in and out of memory and time before falling asleep in a movie. Once he falls asleep the film becomes a 3D single take dream that rehashes everything we've seen in the previous hour to no real purpose. It is telling that all anyone talks about concerning this film is the hour long 3D sequence. No one really talks about the plot only the single take sequence that spins around and around a small village. It's also telling that they talk about the technical virtuosity of the sequence and not what happens in it. Clearly no one really cares about the plot. Personally I found the whole film a mess. The plot is a jumble and makes almost no sense. Yes it all looks and sounds good but that is all. As for the 3D sequence it's really not that good and looks like a cheap TV production especially when compared to the lush images in the first half. It is all sound and fury signifying nothing... except a wasted evening. 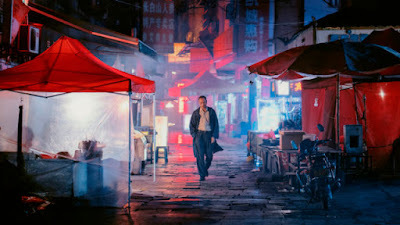 More cinematic tone poem than neon noir, LONG DAYS JOURNEY is a long dull haul best enjoyed by those who prefer form over content and pretension over meaning.